As a member of the Shank Lab at the Woods Hole Oceanographic Institution, I have been involved in a number of fantastic sea-going expeditions all around the globe (for a full list, scroll to the bottom). These photos document (1) a 2009 cruise to the Mariana Trench on board the R/V Kilo Moana with the submersible HROV Nereus and (2) a 2014 cruise to submarine canyons on the US Atlantic shelf break on board the NOAA survey vessel Henry Bigelow with submersible ROV ROPOS. The Mariana Trench cruise took place during my graduation from Oberlin College, so we had an impromptu graduation on the ship. Check out this interview for Nautilus Live while at sea in 2012 on board the R/V Nautilus. The 2009 HROV Nereus cruise to the Mariana Trench was covered by Discovery Channel in an hour-long special program. Here, the film crew interviews Dr. Patty Fryer and educator Linda Tatreau. A sea cucumber (Holothurian) from the trench. I missed my graduation from Oberlin to participate in the HROV Nereus cruise to the Mariana Trench. The cruise participants still threw me an impromptu graduation on board, though, and it was a riot! 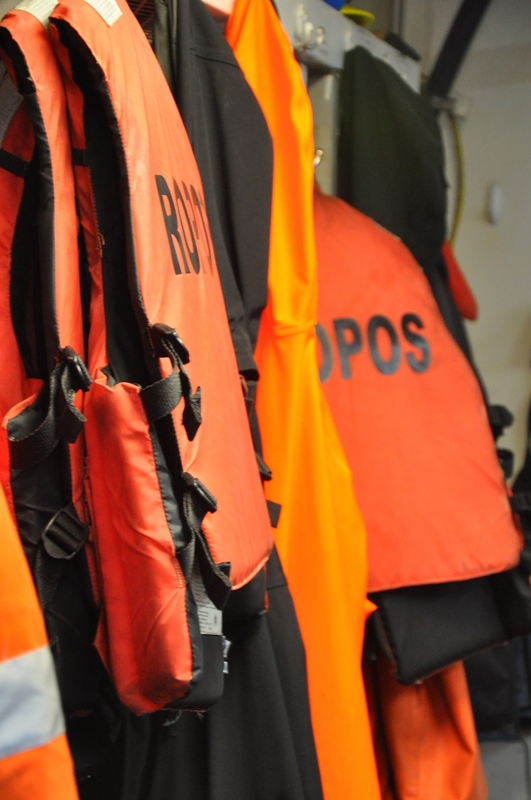 Life jackets on the NOAA Vessel Henry Bigelow. Photo taken during the 2014 ROPOS cruise to Northeast Atlantic Canyons. 2014 Scientist and Data Logger. NOAA Survey Vessel Henry Bigelow, ROV ROPOS. Dates: June and July 2014. Location: Northwest Atlantic Ocean, canyon habitats. Chief Scientists: Martha Nizinski (NOAA), Anna Metaxas (Dalhausie University), Tim Shank (WHOI). 2013 Shore-based Scientist and Event Logger (participation via telepresence). 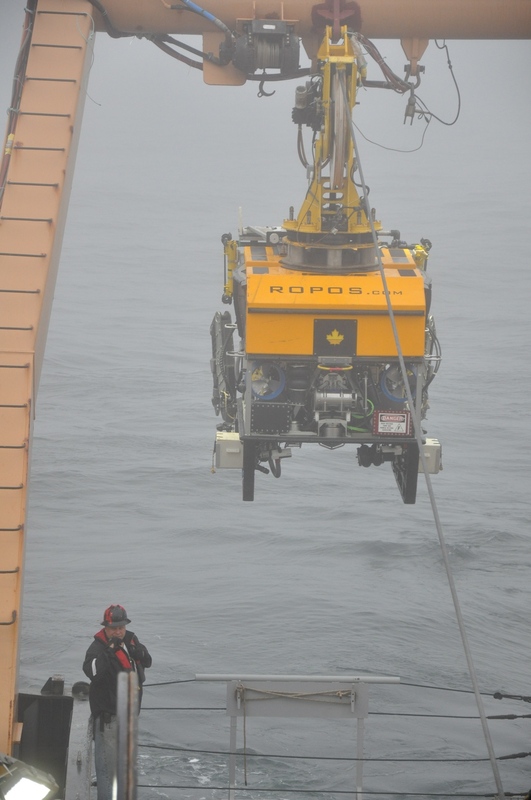 R/V Okeanos Explorer, ROV Deep Discoverer, “EX1304 Leg 2: Northeast US Canyons Expedition 2013.” Dates: August, 2013. Location: Northwest Atlantic Ocean. Chief Scientists: Amanda Demopolus (USGS) and Martha Nizinski (NOAA). 2012 Shore-based Scientist and Event Logger (participation via telepresence). R/V Okeanos Explorer, ROV Little Hercules, “EX1202 leg 2 and 3: GoMEX 2012, Gulf of Mexico Expedition.” Dates: March 19-April 28th, 2012. Location: Gulf of Mexico. Chief Scientists: Tim Shank (WHOI) and Jamie Austen (UTexas). 2011 Field Assistant. R/V Tangaroa, “TAN1113 Biophys 22.” Dates: October 2011. Location: New Zealand Continental Shelf. Chief Scientist: Scott Nodder (NIWA, NZ). 2010 Shore-based Scientist and Event Logger (participation via telepresence). R/V Okeanos Explorer, ROV Little Hercules, “EX1004 leg 2 and 3: INDEX-SATAL 2010, Indonesia-USA exploration of the Sangihe Telaud Region.” Dates: July 21st-August 6th, 2010. Location: Indonesia. Chief Scientist: Tim Shank (WHOI).